Adam Gase, the Miami Dolphins new head coach has his work cut out for himself as his team faces the Seattle Seahawks at home in one of the most intimidating and loud stadiums in the league, the CenturyLink Field. 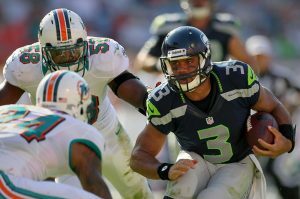 Historically the Miami Dolphins have had a lot of success against the Seahawks but the two haven’t played each other in four years and a lot has changed since then, and Seattle is the biggest favorite this week, which says it all. Everyone knows that a road game is though in the NFL, and the Miami Dolphins will not have an easy time in their first game. For starters there’s the Seattle Seahawks defensive team, which lead the league in points allowed the previous two seasons. Although, Miami quarterback Ryan Tannehill gave a good performance during the pre-season, there are still questions about the Miami offense as a whole and especially of how good Tannehill’s performance in the red zone can be against the Seahawks defense. There is also uncertainty as wide receiver DeVante Parker is questionable for Sunday’s game due to a hamstring injury, so Miami will rely on possession receiver Jarvis Landry and deep threat Kenny Stills in combination with tight end Jordan Cameron to bypass the defense which had trouble covering tight ends last season, and hope this will be enough to score a much coveted win for the Dolphins. Seattle has a great team, a team which has bonded and stands together, point in case is the fact that on Sunday’s game the entire team is expected to either sit or kneel during the National Anthem in support of Colin Kaepernick’s silent protest. The team is backed by head coach Pete Carroll, who defended cornerback Jeremy Lane when he sat during the national anthem in the last pre-season game. This is a symbol of how close the team is and how they stand by each other and playing at home gives them a huge mental advantage. They won’t have an easy time though; the team has lost some of its key players, like running back Marshawn “Beast Mode” Lynch who retired and another 3 offensive starters from last year are also gone. If Garry Gilliam starts as right tackle Sunday as expected, he will be the only lineman from last season to begin the 2016 campaign in the same spot. The Seattle offensive line performed unexpectedly well during the preseason, but is still considered one of the most vulnerable blocking units in the league. And you can bet that vulnerability will be exploited by the Dolphins who will start their defensive linemen Ndamukong Suh, Cam Wake and offseason addition Mario Williams. Despite all the changes in their lineup and the offensive vulnerabilities, I predict Seattle will have their first win at home this Sunday.